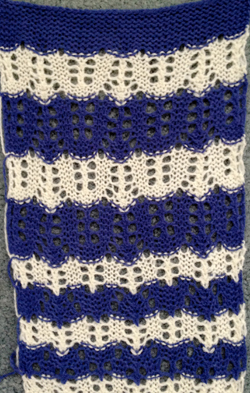 In machine knitting, frequent color changes are more conveniently made with a color changer. On the Brother KM the latter is placed on the left side of the machine, so the knit carriage will be knitting by default an even number of rows moving from left to right and back to the left. In turn, the lace carriage will need to move from right to left and back. To retain the same pattern, the card may be flipped over, and marked accordingly. 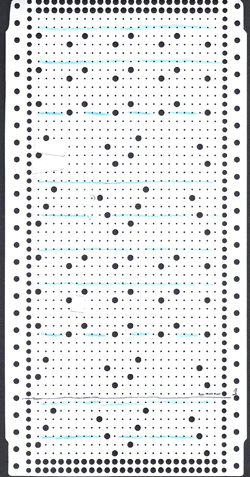 Here is an image of the card generated in the previous post, flipped vertically. I prefer colored lines to arrow and other markings: blue line indicates 2 rows of knitting with KC (a different color could be used to indicate color changes for striping once those are determined), starting row 1 is marked in pencil. 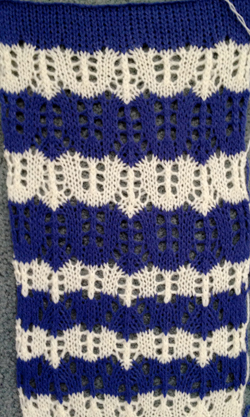 The narrower stripe is spaced 6 rows apart, the wider a full repeat repeat. Like playing with slip stitch variations, there are many more possibilities that could be tried. Long floats up the side next to the color changer may be wrapped on end needle periodically and carried up that side to avoid weaving in “all those ends” upon completion of the piece, while keeping an eye on whether doing so contributes to end stitches on both sides resulting in different “lengths” at its edges. Not all lace patterns are equally successful in this technique, and ultimately choices become a matter of personal preference and style. Missoni striped MK laces are a great source of inspiration. 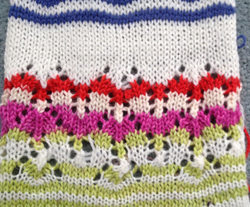 For hand knitting, many pattern playing with striping in lace fabrics with both solid and space dyed yarns may be found at Kieran Foley’s website.